In my first pregnancy I was pretty overwhelmed with the amount of brands and products out there catering for baby needs. However one brand stuck out, Tommee Tippee and it's one I've continued to use into my second pregnancy and also now baby Erin is here. I was recently sent some Tommee Tippee products to review and we couldn't wait to put them to the test. I was quite excited to receive the electric steriliser as we only had a microwave one last time and this was a step up from that! There are several different versions but we tested out the Special Edition - I don't think there is any difference other than the colour, the standard sterilisers are white and transparent but our one had a sleek black design. 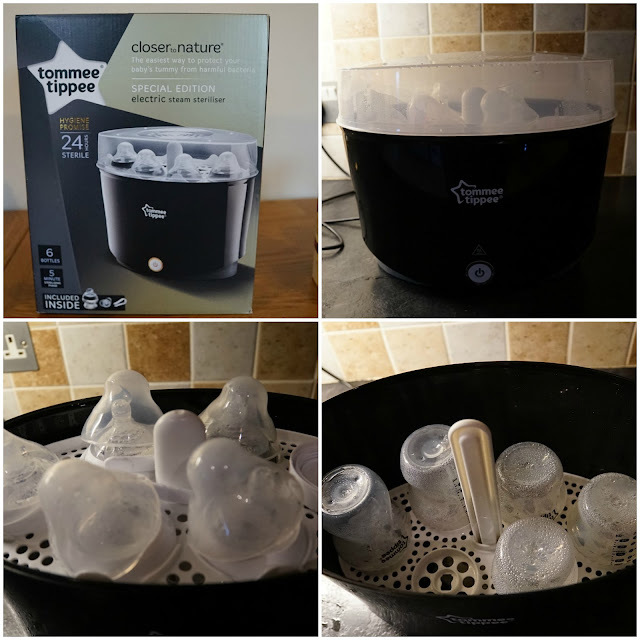 The box contained one of the Closer to Nature feeding bottles - the Tommee Tippee bottles come in several different sizes but this one was the small 150ml variety which is perfect for our newborn needs. Also enclosed in the box was a dummy and plastic tongs for holding the just sterilised items. What I love about this steriliser is that it is SO simple to use. And not just simple but really quick too. Very important for those times when you run out of bottles and you need one, right now! All you need to do is fill the steriliser base with 80ml of water - this is very straightforward as this amount is marked on all the Tommee Tippee bottles so you know exactly how much you need. Once you have added the water, load the steriliser up with your bottles - it will hold up to 6 bottles which is really handy when your baby is feeding lots in the early days. There is room on the bottom layer of the steriliser for the bottles and the top shelf is for your teats and lids. When you're all loaded up, you simply just press the on button on the front of the steriliser (this will turn orange to let you know it's working) and 5 minutes later it's done! The steriliser will kill 99.9% of household bacteria which is great and is 100% natural using no chemicals. I'm really impressed with this piece of kit, as mentioned before it is so easy to use and super quick. It is also really quiet so whilst it is sterilising, it barely makes a noise so won't interrupt naptime! My only criticism is the power button doesn't feel very sturdy and sometimes you do have to press several times before it stays orange but that is just a small niggle, overall I think the electric steriliser is a great product and I know we will be using it alot over the next 12 months! Tommee Tippee have designed these bottles to mimic a Mum's breast, with an easy to latch on teat shape. This is to ensure the switch from breast to bottle is as easy as possible. Breast feeding didn't work out for us but we had absolutely no issues getting Erin to take one of these bottles from the moment we got home from hospital. I find the bottles very comfortable to hold and I'm able to feed one handed with no issues....quite important for night time feeds when I'm scrolling through social media to stay awake! I like the fact that the bottles all have the Easi-vent valve - this eliminates excessive air flow so baby can ingest more milk and less air. The teats are a good shape - they gently elongate and flex during feeding to mimic a breastfeeding action. I have noticed that Erin doesn't really have any excess milk around her mouth when she is feeding so I assume she is getting a good latch on! The bottles are sturdy and well made and we haven't had any leaking issues. They are also very easy to clean with our Tommee Tippee bottle brush. I assumed it would be a similar story with Erin but I popped these Anytime Soothers into my hospital bag and didn't think anymore of it....until night 2 when she screamed and screamed! She wasn't hungry, she didn't need a clean nappy so I thought I'd give her a go with a dummy. And it worked!! 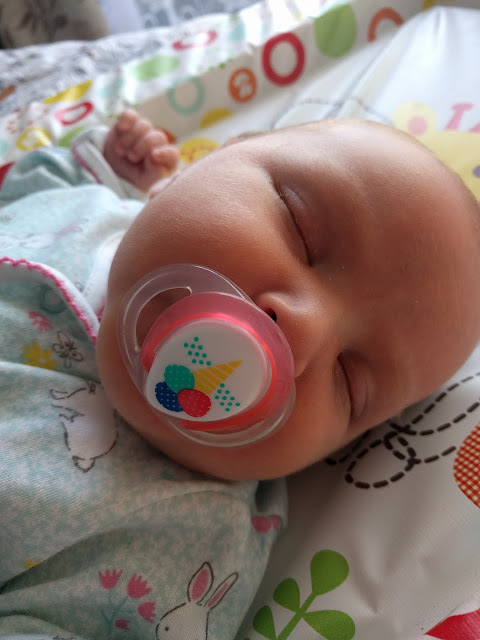 She very quickly settled down and soothed herself to sleep by sucking on the dummy. Now two weeks later I am still using the soothers with her and they do come in very handy. She doesn't have one at night time but she can get a bit distressed when we change her bum (especially if she's hungry!) so it's good to be able to pop one in her mouth and know she will be instantly soothed. The Tommee Tippee soothers come in a range of designs with teats available in ages 0-6mths and 6-18mths. This is a nifty little gadget that we have used lots since bringing Erin home. Not only does it tell you the temperature of the room but also the temperature of baby's bath. The water should be between 36.5C and 38C and if it's too hot, the LED light on the display with illuminate red as a warning. It also couldn't be easier to use - a little tap on the display is all that's needed! The thermometer also floats in the bath too. My husband has been on bath duty over the past two weeks and he said this product is really easy to use - he likes the simple display which makes it very clear to see what the temperature is and it saves guess work when running the bath! 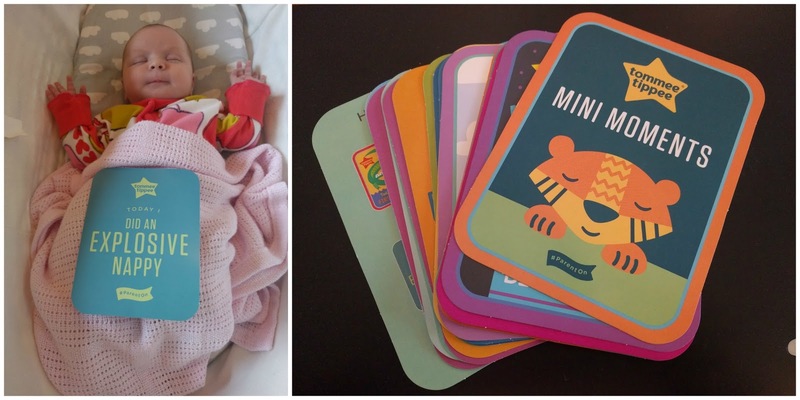 The last thing I want to talk about is these fab baby milestone cards that Tommee Tippee have produced. Milestone cards seem to be a recent fad, I'm sure I don't remember them being so popular when Elliot was a baby! These ones are great because they feature some of the realer moments of parenthood....such as "I was sick on Mummy today!" and not just the standard "I rolled over today" that you get on general milestone cards. 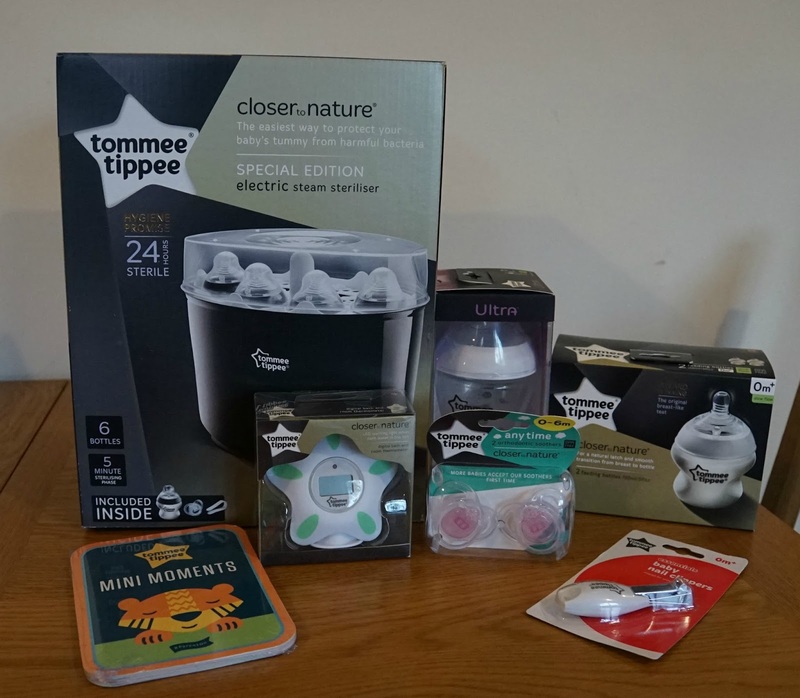 I am really impressed with all the products we were sent from Tommee Tippee - it's great to find a brand that you completely trust and I have no doubt I will continue to be a fan / loyal customer as my children grow up! We were loyal Tommee Tippee users too!